RIDGE TOWNSHIP — A Middle Point man who allegedly threatened people with a knife at Ramblers Roost and assaulted sheriff’s deputies after being apprehended is facing a number of charges in connection with the incident. Jason J. Allen, 45, was charged with two counts of aggravated menacing and one count of obstructing official business, all felonies of the fifth degree; and one count each of resisting arrest, failure to comply with a lawful order, and operating a vehicle while impaired, all misdemeanors of the first degree, as a result of the incident. According to Van Wert County Sheriff Thomas Riggenbach, his office received a 9-1-1 call at 10:03 p.m. Thursday from a woman at the Ramblers Roost in Ridge Township that a intoxicated man had pulled a knife and was threatening another man. When deputies arrived seven minutes later, the saw a man walking to a vehicle, while a woman in the parking lot told deputies that the man, Allen, was the one who was threatening people with a knife. She also noted that Allen had crashed his car into her vehicle. Deputies tried to contact the suspect, but he got into a vehicle and left the parking lot. Deputies then pursued Allen for approximately 1½ miles before he pulled over to the side of the roadway. After stopping, Allen then reportedly began to immediately approach deputies, who had also pulled over. Although deputies repeatedly told him to stay where he was and lie down on the ground, Allen continued to walk toward deputies, and one of them then used a Taser on Allen, but it failed to stop him. Another deputy, who could not stay away from Allen, struck the man in the face with a Taser, and then grabbed him and took him to the ground. Allen continued to fight with deputies while on the ground to stop them from placing handcuffs on him, but additional deputies arrived at the scene and all of them together were finally able to cuff Allen’s hands behind him. 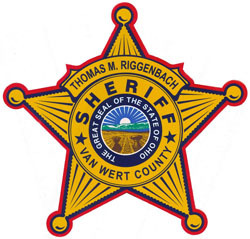 Sheriff Riggenbach said three deputies were injured to varying degrees and were treated at Van Wert Health and then released. Deputies also learned that Allen had pulled a knife on two people at the Ramblers Roost, saying he would cut them and kill them. Although the couple was able to leave the business, Allen apparently followed them in a car and purposely crashed into their vehicle. Allen is being held at the Van Wert County Correctional Facility prior to his arraigned in Van Wert Municipal Court. The sheriff said an investigation into the incident is continuing and more charges could be filed. The Van Wert Post of the Ohio State Highway Patrol and Middle Point EMS both assisted deputies at the scene.